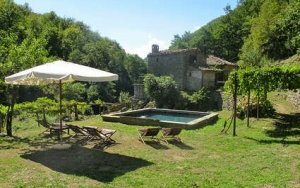 541 Partially renovated town house with gardens and stone barn in Bargecchia, Garfagnana, Lucca. 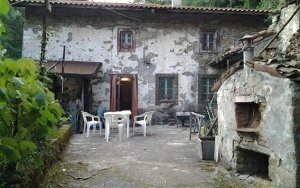 Partially renovated house, set on three levels, situated in Bargecchia, in Garfagnana, with garden and barn. The property consists of basement, ground floor and first floor and it needs to be renovated. It has been structurally consolidated with steel beams thus respecting contempoary earthquake regulations. Plus, it must be noticed that the basement floor has been lowered to permit that the height conforms to the present building regulations. On the basement level there are three entrances, one of them is an arch. Inside, the walls are made of stone and the ceiling is made of terracotta and wooden beams. This level is divided in two spaces. The access to the ground floor is via an internal staircase or via an external one. On this level there are wooden beams on the ceiling. The layout mirrors the one of the basement, it has a living room with fireplace and a space that could be divided in a study and in a bathroom. On this floor there is also a panoramic balcony overlooking the garden, with stunning views of the valley. It is important to note that this entire floor has been made with reinforced concrete. The first floor is divided into three spaces which in the past were used as bedrooms. This level requires to be renovated. There is a stone barn near the main building which has a great potential and is situated in a very pleasing position. The land is approximately 2500mq and it is slightly inclined. Parking area- In front of the house there is a private parking area included in the sale. 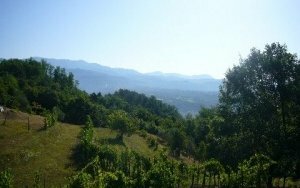 The property is located in a uniquely beautiful area and it has a graet potential if renovated. 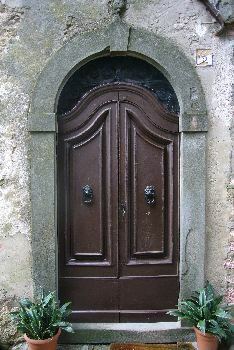 Village house in the heart of a medieval hamlet in the north of Tuscany in need of renovation. 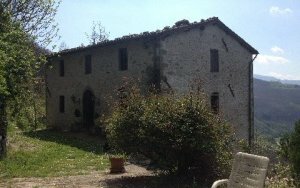 Stone built farm house with large barn, set in 2 Ha of land, situated on the crest of a hill with panoramic views.